Messaging – in One Intuitive Interface. Manage your calling activities directly from your CRM, saving you time to have more conversations. With built-in call functionality right from your CRM, you’ll be fully prepared to deal with your customers’ requests, improving their experience. Access a full view of your team’s activities through advanced analytics and dashboards, helping you to monitor their call performance and measure their success rates. Grow and scale your business easily and successfully with a flexible and cost-effective cloud-based solution. One of the benefits of using CloudCall has been the seamless transition between calling and our database, which saves time as we no longer have to manually dial. We’re constantly evaluating the tools that are out there on the market and making sure that our teams have access to the best of the best and that’s what led us to CloudCall. CloudCall, for us, is simplicity. It's easy to use, it doesn't require a great deal of training and it just makes life a little bit easier. CloudCall has saved our users time and made them more efficient. Making calls with a single click and having the ability to save and record calls directly into our CRM has massively benefited our users. We know that each role, each department and each industry comes with their own unique set of requirements. CloudCall has been developed with the flexibility for use across a wide variety of business areas. As a Sales professional, you’re targeted on the number of deals that you close. To close these deals, you need to have successful conversations with your prospects. We provide a solution that makes it quick and simple for you to speak to your contacts, right where you manage your data. Being in charge of a team can be a challenge. Being in charge and not being able to keep track of your team’s calling activities is even more so. At CloudCall, we know that being able to access real-time activity reports and analytics is important to ensure that your teams are running efficiently. Without customers, it would be difficult for any business to thrive. As a customer service professional, you need to be able to wow and delight your customers by juggling multiple requests, cases, and conversations. CloudCall provides you with a simple way of keeping track of these conversations. You can spend a lot of time on the phone, building strong relationships with your contacts. 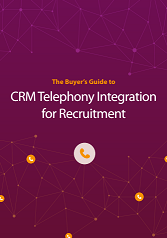 We make this easy by adding voice to your recruitment CRM so that you can call directly from the contact’s record and add notes, providing a full picture of the candidate’s skills and the client’s requirements.